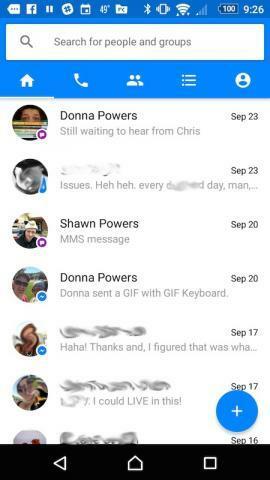 Yes, this makes me a bit of a sellout, but I've found it incredibly useful to have my Facebook messages and text (SMS/MMS) messages in one place. There are people I often communicate with via Facebook, and people I usually text. Thanks to Facebook Messenger acting as a client for both, I can communicate from one application. Because using multiple apps for Facebook was my initial beef with Facebook, allowing me to consolidate texting and messaging actually makes me happy. I know the idea of using Facebook Messenger for texting isn't everyone's cup of tea. I didn't realize it was an option until recently, however, and I am really enjoying how it works! You can see in my (slightly blurred) screenshot, messages are differentiated by their icons. The purple icon means it was an SMS or MMS, and the blue icon shows a Facebook message. Even though it makes me feel a little like a sellout, if you use both texting and Facebook messaging for communicating often, I recommend giving it a try.